The list you are about to see is probably going to make most people relate to it! We are all forced to use some of the means of public transportation on a daily basis. This is inevitable in the big city, because not everyone owns a personal vehicle. Even if you do have a car, you will always end up being stuck in traffic, so the subway remains as the best alternative. However, sometimes the daily commute can be interrupted by someone weird or some unusual activity. Check out the list below and see if you have witnessed some of these things yourself! 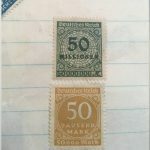 We begin the list with something that it is beyond unusual! 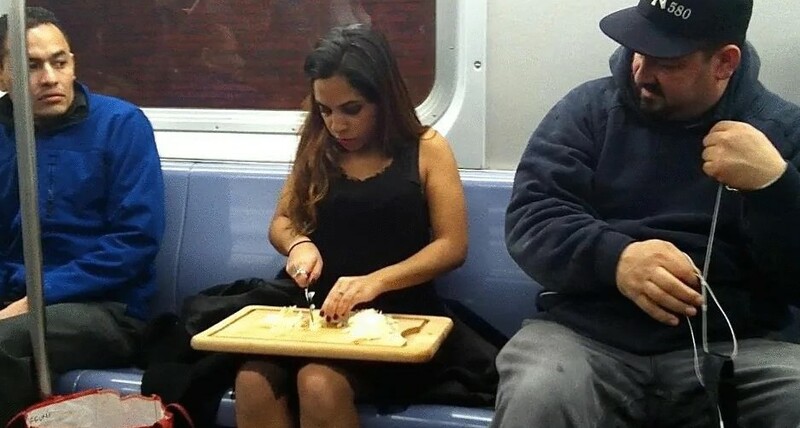 Yes, this really is a woman who decided to cut some onions on a cutting board in the middle of a subway car! The reasons behind this remain unknown and we are not sure if we want to know them! As you can see, she is really focused on the task, and the people around her cannot believe their eyes! Maybe she was a cook on her way for a job interview and she wanted to make sure she does everything right, who knows? The majority of people know that they are going to spend a lot of time commuting so they use that time for different activities. Some of them read or work on their laptops while others just sleep until their stop arrives. Many people use that time to snack on something. 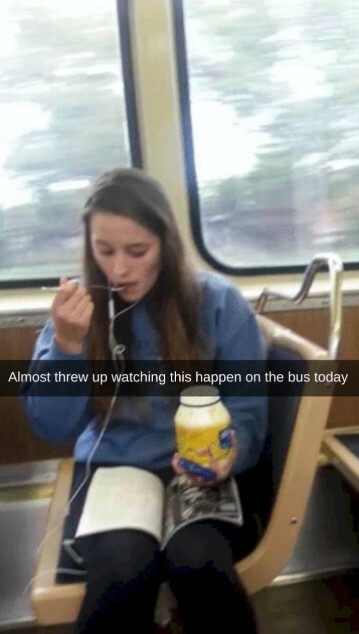 However, eating mayonnaise straight out of the jar while riding the bus is different than ‘having a snack’. We cannot believe that someone could eat this stuff like that. People can carry a lot of weird items with them while travelling or commuting. In some cases these items are just plain creepy. This example is no exception! As you can see, there is a rather disturbing sticker on that box! 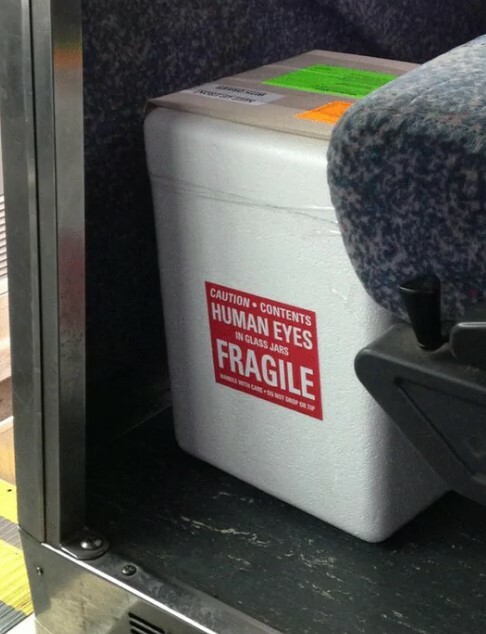 It seems to be one of those specialized organ transportation cases and we believe that the sticker is put there for a reason. It looks like a twisted joke and we bet that this image would give someone the idea to make a similar sticker for their suitcase. You probably know that a lot of people prefer to fix something temporary until they repair or replace it. These temporary fixes often become permanent! The case with this bus bell would probably end up the same! However, we failed to guess why they installed a rubber chicken to replace the original bell button. You probably know the noise these chickens make when squeezed. This means that it would really serve its purpose, but it still looks ridiculous. When you want to create the perfect ad, you need to have a good idea and the right team. It may look like an easy thing to do, but it is actually a task that requires a lot of planning! The skillset needed to create quality marketing content includes the ability to formulate the best message and to visualize it in the best possible way. As you can see, it did not work out well for the people who created this ad. 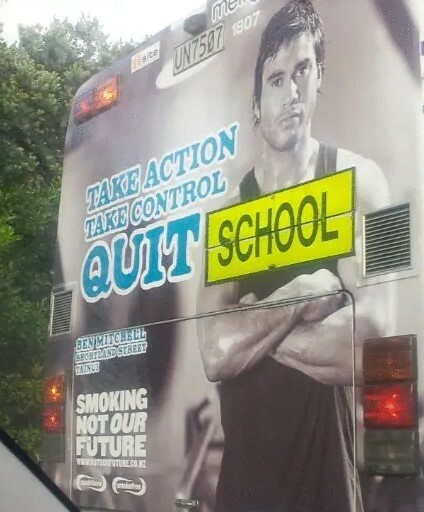 Their message got a completely different meaning because of the School sign on that bus. Sometimes even a disaster would not be able to stop someone who has a strong spirit! 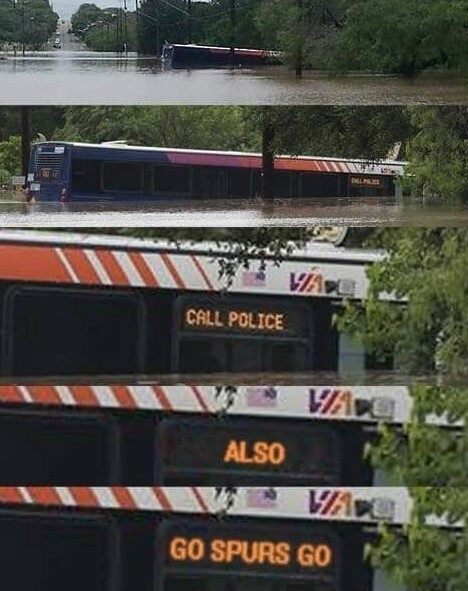 As you can see, this city bus got trapped in a flooded boulevard. Half of the bus is submerged under the water and it seems that it would be stuck there for a long time. What’s really alarming is that there were people inside! Even if they were safe for the moment, you would imagine that they must have been scared. However, the digital sign on the side of the bus suggested something else! If the trip to work is a long one, you definitely need to figure out what to do in that time in order not to waste it. You can watch a movie or read a book. Of course, you could spend an entire hour browsing different social media platforms. As you can see, someone decided to spend that time in a much better way! The clever sketch you see is probably one of the many this talented artist created. 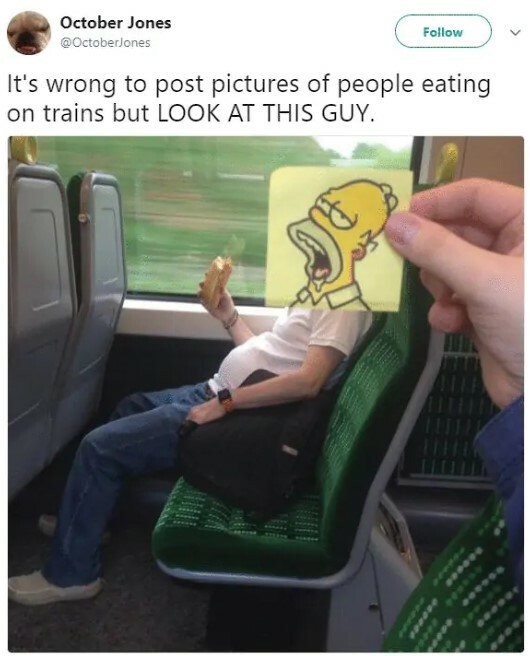 What a quality way to spend your time on the train! One of the most annoying things about public transportation is the lack of personal space. Especially during rush hour you are likely going to be deprived of any personal space regardless of the means of transportation you chose. 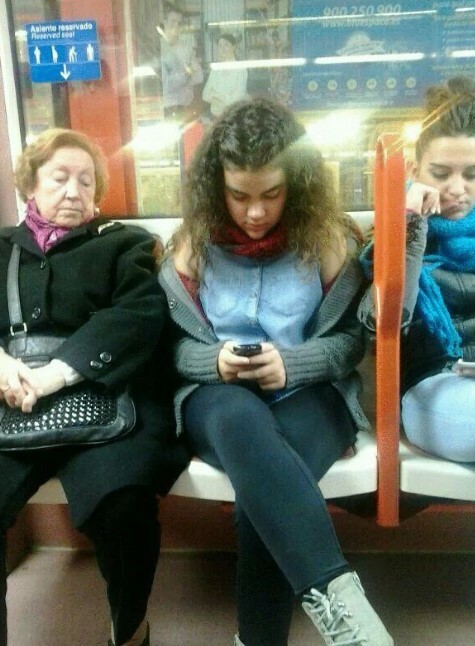 Of course, most people are willing to their best in order to respect the other commuters and provide them with space. Unfortunately for them, certain individuals often do the exact opposite and they are not willing to comply with the situation. 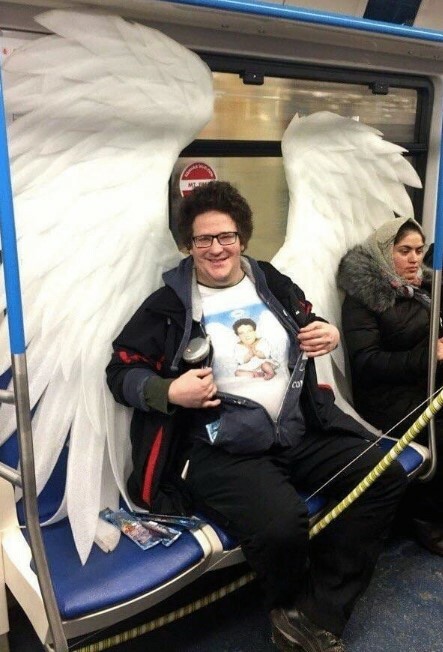 As you can see, this man decided to get on the subway with these huge angel wings attached to him. We have no idea why he chose this ridiculous outfit, but he is taking too much space. That does not seem to bother him, though. Many people use every chance they get to show that they are different from the crowd. The drive to do things in your own way can be either a good thing or a bad thing. It depends on the person and their character and intellect. As you can see, this person decided to take her pet for a walk. However, it is not as normal as it sounds. She thought that this huge gecko would feel comfortable on her head. 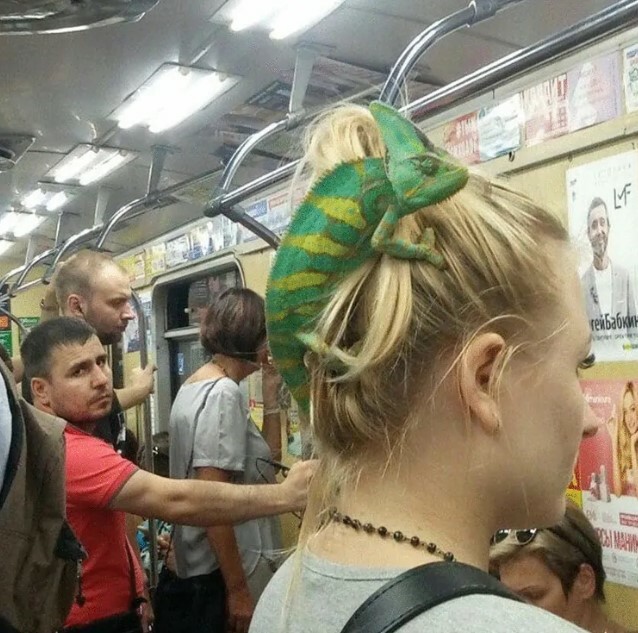 The lizard also serves as a hair clip which is handy. 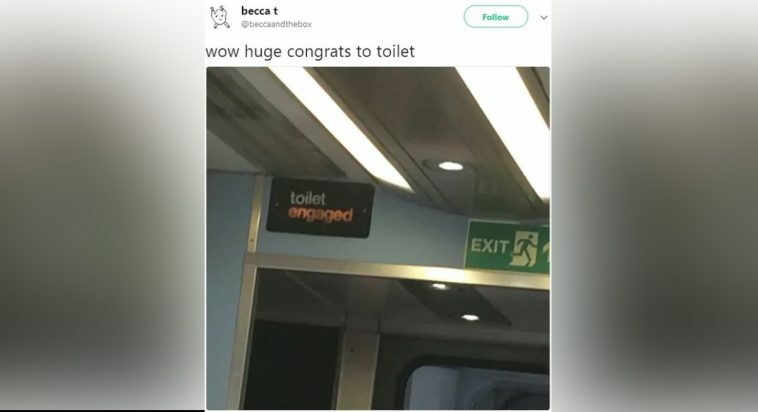 The rest of the commuters seem either puzzled or unimpressed by this. As we already mentioned, people spend a lot of time commuting. Most of them use that time to browse social media and send texts. This is not as easy as it might seem. If you are standing, you need to hold on to something in order to secure the position. Nobody want to fall down, right? One of the other things that make it hard to enjoy scrolling your phone is other people’s curiosity. 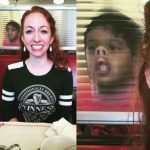 As you can see, this girl does not seem to notice that the elderly woman sitting next to her is peeking over her shoulder. This is quite rude and totally unacceptable! Probably the last thing you would expect to see during your morning commute is a wild animal in the seat next to you! As you can see, this coyote looks really comfortable and is curious why would someone pay attention to him? We have absolutely no idea how such a thing might be possible! 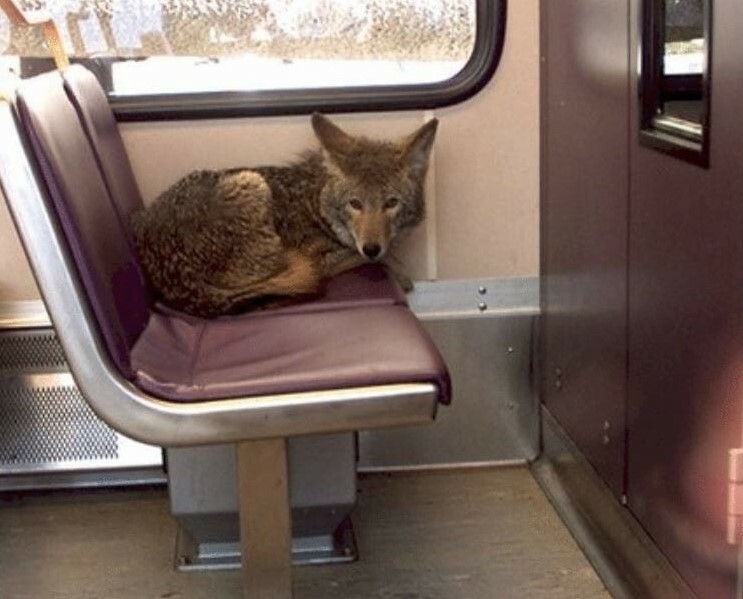 Of course, someone probably called for help and the coyote was removed from the train and taken to a shelter. We hope that nobody got hurt in the process, but we think it was all good, because the coyote looks as friendly as possible. Sometimes we find ourselves in a situation which is more or less embarrassing. We wish that we could foresee these situations, but it is impossible. However, they are not that serious after all. The worst that could happen is your friends seeing you and having a few laughs about it. 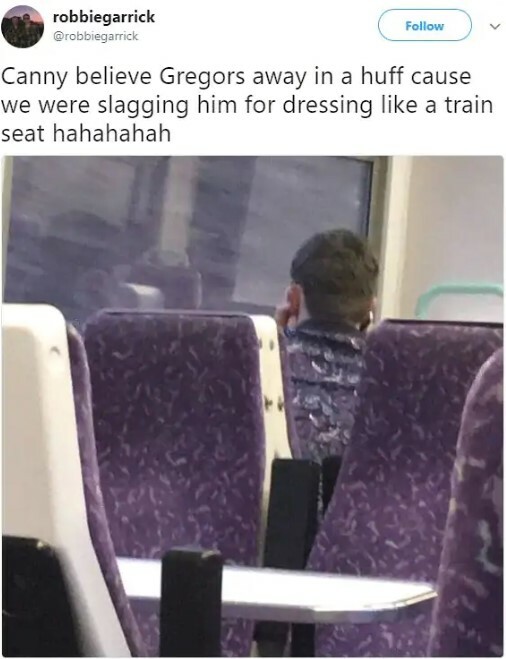 This is what happened here after this person decided to ride the train in the same outfit as the pattern on the seats. Talking about a funny coincidence! 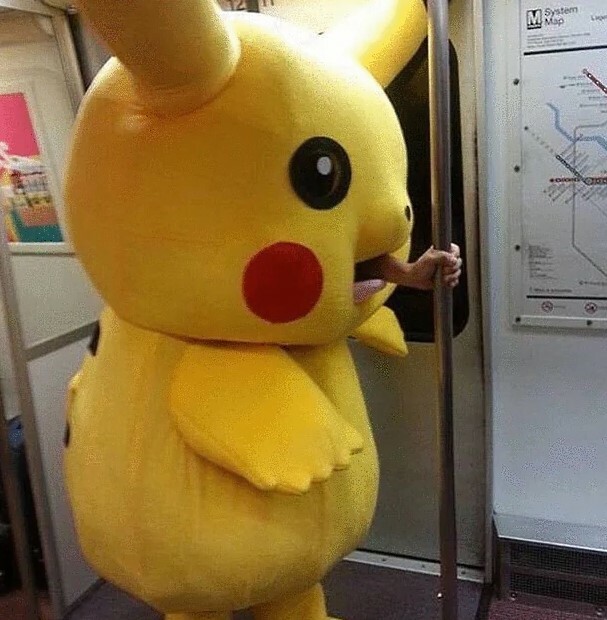 If you see Pikachu in a subway car, you would probably be overwhelmed. However, we are not talking about the game, but rather a giant Pikachu costume that someone decided to wear for some reason. It would be kind of curious to see such a thing, but there is one small detail that ruins the whole picture. As you can see, there is a human arm stretching from Pikachu’s mouth, which is a disturbing thing to see!